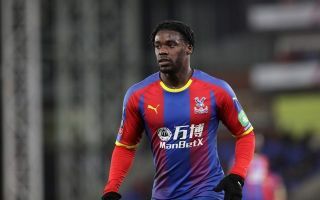 Crystal Palace star Jeffrey Schlupp was left surprised after he was credited with the all important goal of Ghana’s win over Kenya yesterday – despite not playing the game. Ghana were victorious in their Africa Cup of Nations qualifier against Kenya yesterday, the side won the clash 1-0 thanks to a goal from debutant Caleb Ekuban but it was Schlupp who got the credit for the crucial strike – despite not playing a single minute of the match. Thanks to yesterday’s win, Ghana have now qualified for AFCON 2019, which will take place in Egypt. It was Africa’s continental governing body, the Confederation of African Football (CAF) as they credited that wrongly credited Schlupp with the goal and the versatile star jumped on to Twitter to alert them to the fact that he didn’t play. This is a pretty big blunder for the CAF to make. It isn’t that hard to see who scored a goal, is it?